The saying that hope springs eternal has a whole new meaning here in Philadelphia this baseball season, thanks to a Phillies team that made bold moves in free agency, including the signing of former Washington Nationals outfielder Bryce Harper to a $330 million contract. The Phillies opened the 2019 season Thursday against the Atlanta Braves at Citizens Bank Park. 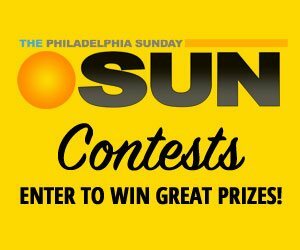 For the first time since the Phillies run of five straight National League East titles from 2007-2011, there are more than a few people that are picking the Phillies to not only win the NL East, but also the National League Pennant. Sports Illustrated magazine went so far as to put the Phillies in the 2019 World Series. In fact, the Phillies—Harper, first baseman Rhys Hoskins, catcher J.T Realmuto, and starting pitcher Aaron Nola — are on the front cover of Sports Illustrated’s 2019 baseball preview issue. If that doesn’t tell you that the Phillies are relevant in the world of Major League Baseball again, nothing will. At the All-Star break in 2018, the Phillies were 53-42 and in first place. They stayed in first place until Aug. 12, but fell part in the second half mainly because they struggled at the plate. After the All-Star break, the Phillies won just 27 of 40 and finished the season in third place. Phillies manager Gabe Kapler will certainly have plenty of power this season to score more runs. 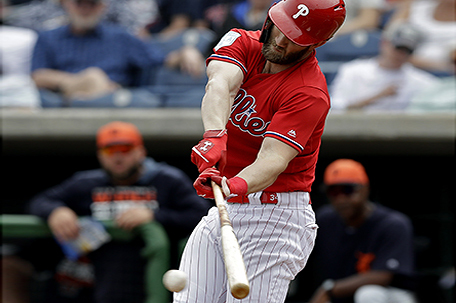 The Phillies come into the 2019 season with plenty of firepower on the offensive end, starting with Harper, who hit 34 home runs with 100 RBI. He is expected to bat third behind shortstop Jean Segura, who batted .304 in 2018 with 20 stolen bases and a .341 on base percentage. Andrew McCutchen, who is coming off a hot spring training at the plate, will be in the leadoff spot. The former Pittsburgh Pirates star batted .289 during the spring with a pair of home runs. With Harper batting in front of him, Hoskins is looking to do even more damage at the No. 4 spot. In 2018, Hoskins hit 34 homeruns and 96 runs batted in despite having a .246 batting average. Five out of the first six players in the Phillies lineup hit at least 20 homeruns last season. Because Citizens Bank Park is more of a hitter’s park, you can expect to see balls flying out. On paper, the Phillies have one of the most formidable offenses in Major League Baseball. Some experts are making comparisons to the days of Jimmy Rollins, Shane Victorino, Pat Burrell, and Ryan Howard. While the Phillies offense gets a boost from the newcomers, the big question for the Phillies has to do with pitching. In the midst of their late-season collapse, the constant in the Phillies starting rotation was Nola, who was in the running for the National League Cy Young Award. In 2018, Nola was 17-6 with an earned run average with a 2.37 earned in average in 33 starts. The Phillies are hoping that veteran starting pitcher Jake Arrieta can bounce back from a subpar 2018 and be the Cy Young Award winner when he was with the Chicago Cubs. But last year, Arrieta was 10-11 3.96 ERA. Meanwhile, the Phillies bullpen, a group that struggled with hanging on to leads last season, acquired former New York Yankees relief pitcher Dave Robertson, who some have projected to be the team’s next closer. But then again, Gabe Kapler, who manages with all the fancy schmancy sabermetrics stuff, might have a bunch of guys vying to play that role. Seranthony Dominquez led the team in saves with 16 saves. Meanwhile, Hector Neris is back for the Phillies in 2019. Last season, he had 11 saves. There’s a buzz around this 2019 Phillies team. Fans are hoping it’s sustained throughout the season. Phillies, Sixers, Go All Out To Win Howard Ready For A Powerful 2013 for Phils What can Brown do for you?